I was getting ready to sharpen my chainsaw for that big oak tree in the front yard, but after having you inject it with iron, it looks wonderful, and the cost was marginal to the beauty it gives my place. I know I have told at least 30 people about you. Bob Baer has trimmed our English styled landscape with perfection. I would have no one else touch our hedges, bushes or trees. They look professionally manicured at all times and that is just what I want! I had Bob remove a problem tree in the corner of my backyard. My challenge was to find someone who could not only remove a tree, but remove one in a very tough spot. The tree was large and positioned in the corner of my back yard where it hung over three adjoining neighbor properties, two converging fences, and a neighbor’s shed. One man declined the job, but Bob took it on and was able to skillfully remove the tree without any serious mishaps. He had all the right skills, tools, tackling, ropes and pulleys to make sure each branch fell safely in the right spot, even despite strong, contrary winds working against him that day. I was amazed that he did the whole job, cutting and cleanup, in one day, arriving at 8:30 am on a Saturday, and working almost non-stop until 9:00 pm, long after dark that crisp, windy October day. Best of all he did the job for a very fair price. I can enthusiastically recommend Bob at My Backyard! Bob, I just wanted to say thanks for the excellent work you did during the removal of two large oak trees from our yard. I was especially impressed with the attention to safety demonstrated by you and your work team. I also appreciate your consideration in taking care to ensure your equipment did not damage any of our existing landscaping or our yard. These were two challenging trees to remove given the proximity to other structures and their size. If we ever have the need for tree removal services or any tree care again you will definitely be getting a call from me. 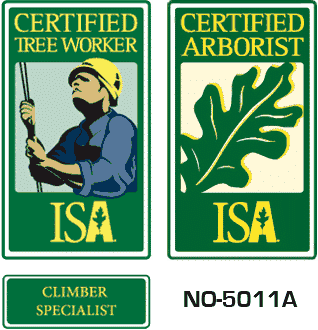 I’m also happy to recommend you to anyone looking for tree service. You were professional, punctual and you followed up to ensure everything went smoothly. Best of luck in 2014. I’m sure you’ll be getting referrals from me and other customers in the coming year. Please contact us using the form below. We would appreciate knowing the address for where the work is to be done as well so we can easily find the location.